Who hasn’t dreamed of living on the Gulf of Mexico?! Well, now is your chance! Aspen Square Management offers a stunning apartment community near Pensacola Bay - a sea port that connects to the Gulf of Mexico. The city offers big town life with a small town feel; a community so close you’ll feel like its family. Pensacola is known as the city of 5 flags, with a rich history and a beautiful historic downtown district leaving you with much to do for entertainment. The city holds many festivals throughout the year and they close down the streets downtown for Gallery Night every month. Every Saturday, local venders come together for a farmer’s market featuring organic produce and hand-crafted items. In addition to an active downtown, the city also features many beaches, bays and rivers so if you love being by the water, Pensacola is the place for you. Love music? Then you will enjoy the city’s Band on the Beach events with live music right on the beach every Tuesday in the summer. Pensacola is Northwest Florida’s cultural, legal, financial and commercial epicenter and is a place where businesses can flourish, creating many employment opportunities to its residents. Commonly known as “The Cradle of Naval Aviation,” Pensacola is home to Naval Air Station Pensacola, the National Museum of Naval Aviation, the Corry Station Naval Technical Training Center as well as the US Navy Blue Angels. If you are looking for a career in healthcare, rest assured as the city has a great healthcare base and houses 3 separate hospitals in the city, with others in the surrounding areas. It is also a city that thrives in the technology area, so it attracts many scientists and engineers. In addition to these employment options, there are plenty of tourism attractions that offer more job opportunities. Downtown Pensacola has grown tremendously over the last 10 years into a bustling community featuring locally owned restaurants and bars. The public school system in Pensacola is the Escambia County School District offering a great source of education for children growing up in the city. Pensacola is also home to 3 colleges, with the University of West Florida being the largest post-secondary institution in the area. There are plenty of education opportunities in Pensacola and they are sure to have the perfect school for you and your children. Aspen Square Management has one apartment community near Pensacola, The Fairpointe at Gulf Breeze located in Gulf Breeze, FL. 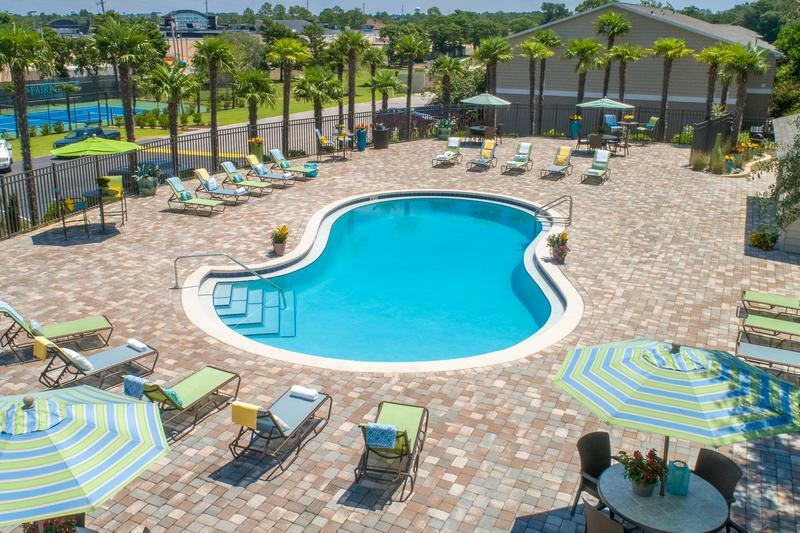 The Fairpointe at Gulf Breeze offers one and two bedroom Pensacola apartments. The Fairpointe is located in a A+ rated school district and is just minutes from the beaches of The Gulf of Mexico. Not to mention all of the wonderful amenities to take advantage of when you make an Aspen Square community your home. You will be welcomed home with lush landscaping that you can take in from your private patio or balcony. Our kitchens have optional white or maple cabinetry, granite-style countertops, and stainless steel appliances. You can stop your search for the perfect pet-friendly apartment because The Fairpointe at Gulf Breeze will be perfect for you and your furry friend. We accept breeds of all sizes, including large breeds and even have an off-leash dog park with agility obstacles. Live the resort lifestyle with a dip in our sparkling pool or lounge on the expansive sundeck. Enjoy our resident clubhouse which features a 24-hour fitness center and business center. The Fairpointe at Gulf Breeze also offers pet friendly apartments in Pensacola, so be sure to bring your furry friend along because it wouldn’t be home without them. Take advantage of the great city that is Pensacola. There’s a great feeling of pride in the community and the city is authentic and conducive to growing a family and a business. Contact us today to learn more about our apartments near Pensacola, Florida.